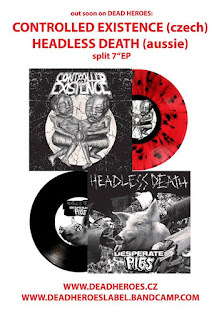 CONTROLLED EXISTENCE: Nová nahrávka split 7 inch s austrálskymi deathmetal grindermi HEADLESS DEATH / A new split 7 inch with australian deatmetal grinders HEADLESS DEATH! Nová nahrávka split 7 inch s austrálskymi deathmetal grindermi HEADLESS DEATH / A new split 7 inch with australian deatmetal grinders HEADLESS DEATH! 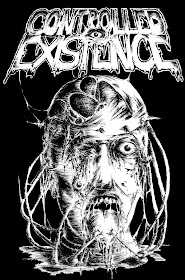 CONTROLLED EXISTENCE // HEADLESS DEATH split 7"EP out very soon!!! We are more than happy to announce the new DH release of the wicked CONTROLLED EXISTENCE guys, the last recordings with a mighty Gifo (the CxEx guitarist), who's gonna play the last gig with the band on 14th January, in Germany! - Blastphemy Winter feast, He's unfortunately leaving the band after the gig. It's been a pleasure buddy, and We wish you all the best everywhere you go, whatever you are planning to do ;-) take care mate. The czechoslovakian warriors are shearing a 7inch w/an awesome Aussie death-metal grinders HEADLESS DEATH. Melbourne based chaotic 90's grindcore (Excruciating Terror, Warsore) and raw old school death metal featuring members from the likes of Internal Rot, Rort and Roskopp. There's the limited edition of 100 coloured splatters and 400 regular hell-black vinyls available.